This past weekend my husband and I drove to Carmel for an anniversary getaway. Because of his injuries we weren’t sure if going away would be realistic so we didn’t plan a thing. Carmel has always been our go-to destination since it’s an easy 1 1/2-hour drive from home so we pinned it on the map for our anniversary. We tried to book a room at our favorite hotel the day before our departure but they were full. In fact, the town seemed to be booked solid. We packed our bags anyway, knowing, at worst, that we’d enjoy a pleasant day trip if we couldn’t secure lodging. My husband has been anxious for scenery besides our living room and backyard, the poor guy. He’s even been willing to accompany me to the grocery store lately. “Get me out of the house!” has been the theme of the last few weeks. He’s not quite back to 100% yet so I was also curious to see how my husband would fare walking around town and at the beach all day. When we arrived in Carmel at 10:30 Saturday morning we decided to pop into La Playa on the off chance that they had a cancellation. And how lucky were we–they had one last room available! It was meant to be, I say. We didn’t get our favorite room but we were very happy to be able to stay at the same place. The hotel was sold to a hotel group and renovated last year. I think it has lost a little of its character–the old paintings in the lobby were replaced with textiles–but it retains its old Carmel feel. There are two things I like most about staying there: First, the hotel is only a couple of blocks from Carmel Beach. Since the property was formerly a residence, it sits right in the middle of the neighborhood. I feel like part of the community, being able to stumble onto the sand for a morning walk with a cup of tea in my hand. On this visit a pod of dolphins hung around close to shore for a couple of days, leaping out of the water from time to time, giving us a glimpse of their beauty. These morning walks are always followed by breakfast in the hotel’s dining room, my other favorite part of these visits. There’s nothing necessarily exceptional about breakfast at La Playa but it’s one of the few times I allow myself to indulge with a big breakfast (also hard to beat seeing and hearing the ocean nearby). 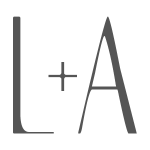 These days La Playa serves champagne breakfasts daily, buffet-style, and with waffles and eggs cooked to order. There’s an abundance of fresh fruit, cheese, smoked salmon and healthier options. On this trip I had for breakfast a waffle, lots of fruit, a cinnamon roll, bacon and eggs. There’s no resisting bacon when I see it before me and while I was waiting for my waffle I had to order a fried egg at the omelet station, too. This girl who typically doesn’t eat breakfast at all had a big smile on her face as she walked back to her table with a loaded plate. This pizza was not inspired by any item in the hotel’s menu but it is a good example of my love for good old bacon and eggs. And they’re fashionable beyond breakfast (carbonara, anyone? ), especially served atop pizza. I’ve had a fascination with quail eggs lately so I picked up a couple of trays for this recipe but regular eggs would do just fine. The rest of the ingredients were items I already had: pepper jack cheese, caramelized onions, arugula, bell pepper. This version offers a nice contrast between the sweetness of the onions, the salty bacon and peppery arugula (I used much more than pictured here) but you can easily make it your own by substituting your favorite accompaniments to bacon and eggs. It will be one hearty, satisfying meal for breakfast, lunch or dinner. Bacon and eggs are not just for breakfast anymore. On a pizza they'd make for a great lunch or dinner. Preheat your oven to 450℉. Place a pizza stone or a cast iron skillet in the center rack of the oven as it preheats. To prepare the pizza dough (from Trader Joe's): remove the dough from the bag and let rest on a lightly floured surface for about 20 minutes. If making personal pizzas, divide the dough into two or three pieces. Roll out. Layer the toppings on the dough--olive oil, cheese, caramelized onions, bacon, bell pepper. 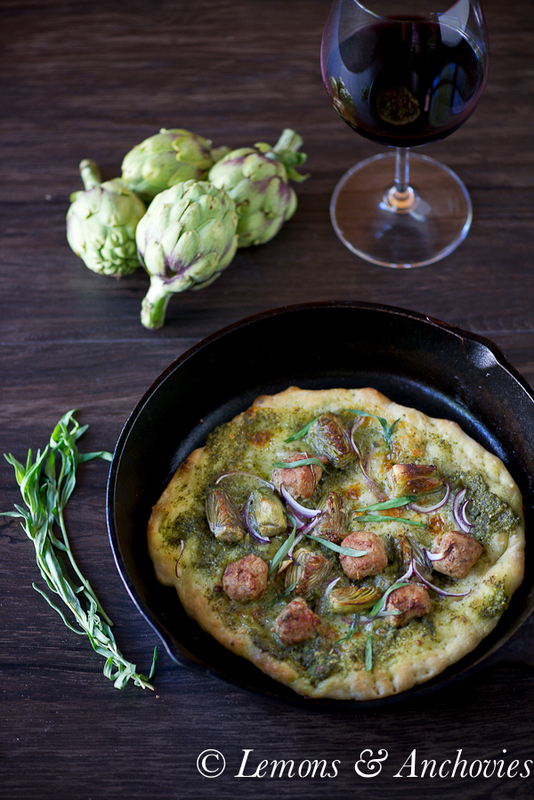 Transfer the pizza to the pizza stone or cast iron skillet and bake about 8 minutes (for small pizza). Remove the pizza from the oven and add the egg(s). Bake for another 4-5 minutes or until the eggs are cooked to your liking. 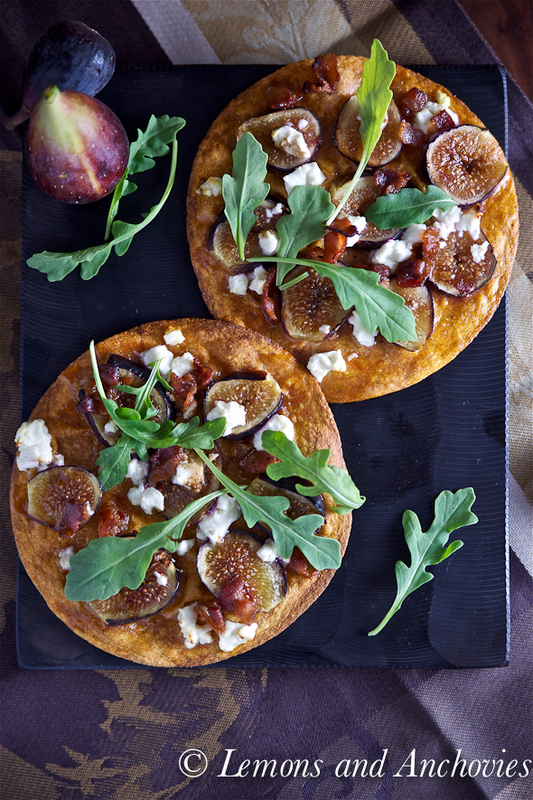 Top with lots of fresh arugula. OMG – this looks divine!!! 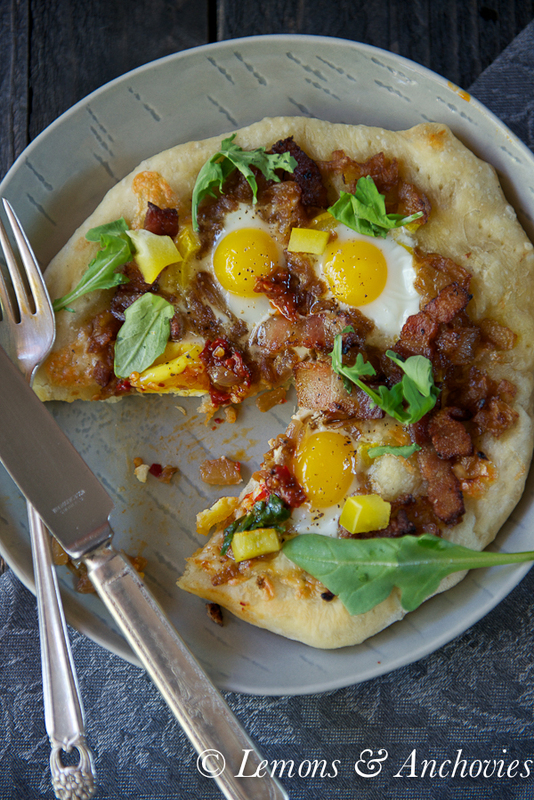 I went to Gather in Berkeley and they serve a egg and bacon pizza that is supreme but I love the idea of making it at home. Will be using your recipe. Sounds like you and hubby had a great time in Carmel! So beautiful down there! I hope you guys had a wonderful anniversary getaway! And this pizza – yes and yes! I could really use this for breakfast in the mornings! 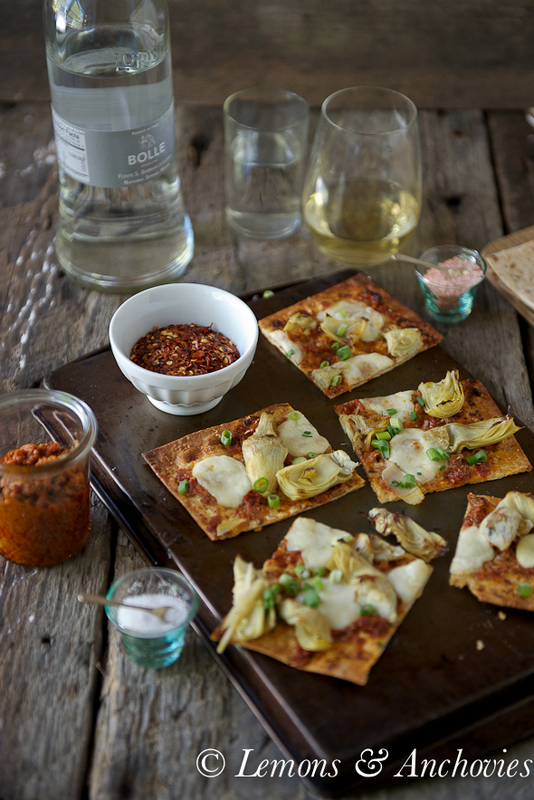 I’ve been on a homemade pizza kick lately so this looks wonderful! So glad you were able to spend a weekend in Carmel. I was there a few weeks ago for the day and it was truly summer gloom – though beautiful, despite the fog! I’m so happy that things are slowly getting back to normal for both of you. What a beautiful way to celebrate an anniversary – the last minute cancellation, the dolphins…the bacon. 😀 It truly sounds like a dreamy getaway. 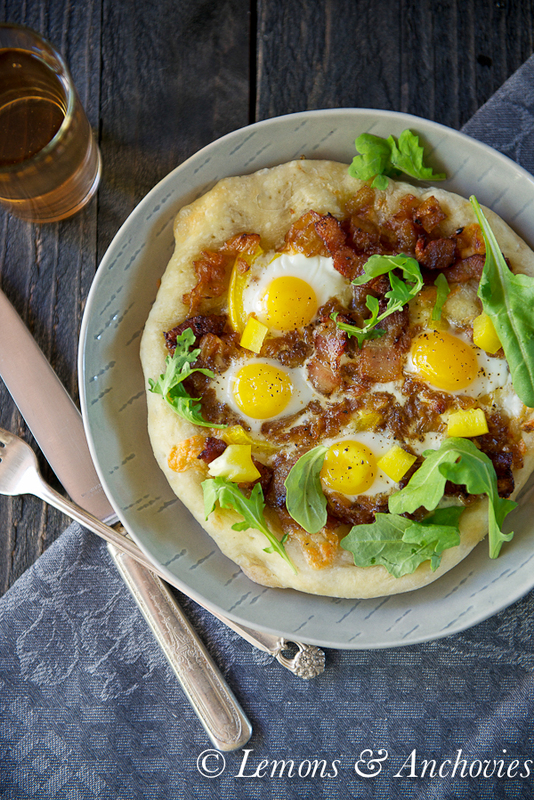 This breakfast pizza is stunning! I’m not a morning eater either but I know I would devour this beauty without hesitation! 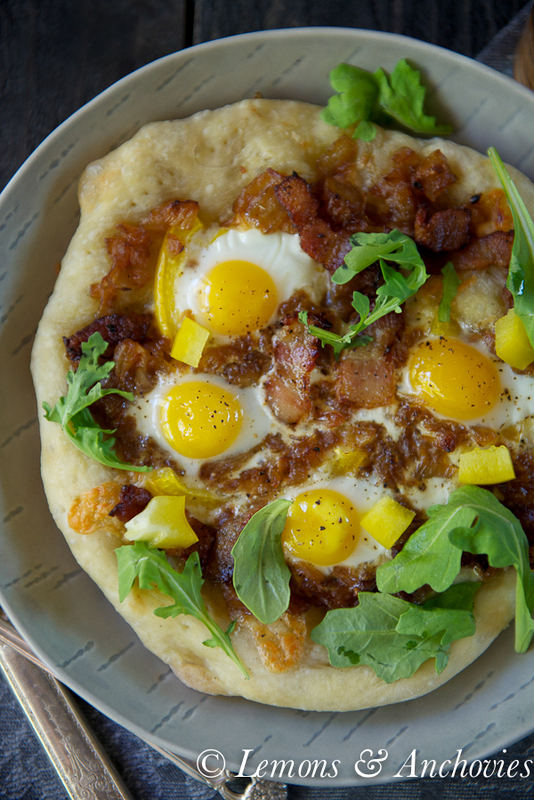 How has no one every thought of bacon & egg pizza before? Brilliant! So glad that you all were able to get away from the house and lucked out at La Playa. It’s really hard to be cooped up – especially if you’re active outdoors like I know you two are. I would LOVE this pizza! This look fantasttic, I could eat it for breakfast, lunch and dinner! Made this tonight. I’ve had something similar at a specialty pizza shoppe and was dying to have my family try it. I didn’t have a pizza stone or a cast iron skillet but I do have a stainless steel pan I use in the oven, so I substituted that. The Pizza came out great, but the egg didn’t cook properly. The yolk cooked all the way through like a hard boiled egg, but the whites were still snotty in some place. Next time I will cook the egg separately and add before serving. I also substituted that arugala for fresh basil leaves! Overall I enjoyed it (not as good as the pizza shoppe) but my family wasn’t excited and I was asked not to make it again…maybe it’s just for the adventurous at heart! Hi, Nicole. Thanks so much for trying out the recipe and I’m so sorry that it didn’t work out for you. I think my using much smaller quail eggs had something to do with the difference in our results. Thanks so much for your feedback! Bacon egg and pizza! Count me in, can’t imagine anything I’d like better! Definitely a fun treat to serve for breakfast when I have guests in town! And I love that you made it with pepper jack cheese (my favorite).